STELLIA is a mother of three and also stepmother to three. She was one of the learners from our very first class of 2014. 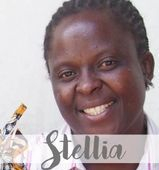 In 2016, Stellia came on board as Head Teacher to pass on her skills to future classes. She has a gentle and humble character and is always willing to learn. Stellia sews our best-selling giraffes and chameleons. She is also part of the local tailoring business formed by her class of graduates. 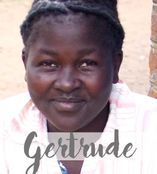 GERTRUDE is a quietly confident young mum of one who graduated from our sewing program in 2015. She has a keen eye for detail and is an expert at sewing all types of bags, backpacks, and zip pouches. Gertrude also sews our popular hippo toys. She is part of the 'Tiyamike Tailoring' - a tailoring business at Blantyre Markets formed by her class of graduates. CHRISSY is mother of five and grandmother of one. She began her sewing journey with Tiyamike Sewing in 2014 and has come a long way in her skills since then. Chrissy's forte is in sewing small detailed items. She is the seamstress behind our popular Nativity set, tea set, and Noah's Ark set. 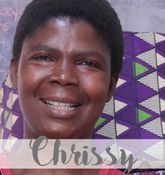 Chrissy is part of the local tailoring business run by her class of graduates and is also the friendly face you will see when you visit our shop in Namiwawa. 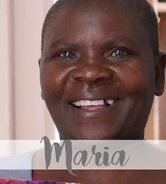 MARIA has a witty sense of humour and likes to dance and sing praises to her Saviour. She is a mother of four but sadly lost one of her babies many years ago. Maria missed out on the privilege of finishing her primary schooling but makes up for it now in her sewing! She is the face behind our beautiful table runners, quilted blankets, and picnic blankets. 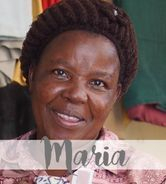 Maria is the supervisor for the tailoring shop at Blantyre Markets that she and her class of graduates formed. MARY is a softly spoken mum of two who has been working hard at improving her sewing skills. She took time out in the midst of learning to have her 2nd child but quickly caught up in missed skills when she returned. 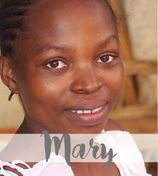 Mary is part of the local tailoring business that she and her fellow graduates run. She sews our beautiful baby bibs and drawstring bags. 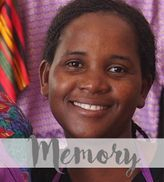 MEMORY began her sewing journey with us in 2014. She is a mum of three whose husband pastors a local church. She later joined our team as a teacher. In 2017, Memory and her husband moved out of town to plant a church in Zomba. She is now running Tiyamike 'Satellite Classes' from her home to teach sewing skills to women in her community as a way of reaching them with God's love. Memory sews our all time favourite kids' elephant backpacks. 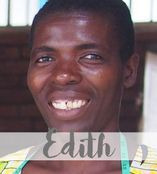 EDITH is a mum of five who very quickly picked up the skill of sewing. She graduated in 2015 whose work is always neat and tidy. Edith's forte is in sewing dress and clothing. She, along with others from her class, recently opened a tailoring shop together at the local markets. Edith sews our gorgeous buntings and funky guitar straps. MARGARET is mum of three and aunt to a nephew whom she cares for as her own. She graduated from our sewing program in 2015 and enjoys sewing dresses as gifts for people. 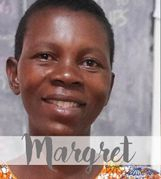 Margret also works with the other graduates at their tailoring shop. She has learnt to sew very well our pencil tote bags (sold with the Colours of Malawi colouring book). MARIA is one of the more senior students in our program and is mum to grown up children. She began learning in 2014 and takes great pride in her work. Maria didn't get to finish school as a child and so cannot read or write, though she would love to learn! Her specialty is the cute crinkly caterpillars. 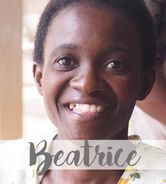 BEATRICE is a fun-loving single mum of one who has recently graduated from our program (June 2017). She is a fast learner who is always up for a challenge. Beatrice sews beautiful girls dresses and pencil cases. 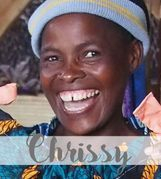 CHRISSY loves Jesus and has just graduated from our sewing program in 2017. She is an active member of her local church and has been a Sunday School teacher for many years. Chrissy is a mother five children and works hard to make ends meet. She picked her the skill of sewing very quickly and continues extend her repertoire of skills. Chrissy sews our kids and adults aprons. ROSELYN is a strong woman who recently lost her 13-year-old (one of six children) to a brain tumour. She is a woman of faith and is active in her local church. 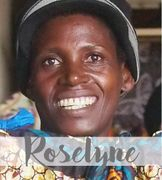 Roselyn began joined the 2016 sewing class and has worked hard at learning. She, along with her husband Limited, are the makers behind our very popular 'water bottle seats'. Limited makes the insides while she sews the covers. ELLEN graduated top of her class in 2017 and has since returned as an Assistant Teacher. She is a single mum of six with a kind and gentle spirit. 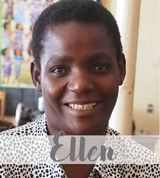 Ellen is a great teacher who excels at guiding learners with her gentleness. Ellen is a fast learner with a good sense of 'quality control'. She is very good at sewing dresses and is also the face behind our awesome soft pots. 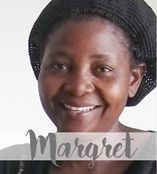 MARGRET is a widowed mother of five who is a faithful Jesus follower. Her gentleness is evident in the way she loves on her youngest 2-year-old girl. Margret is a keen learner with a sharp eye for details. She sews beautiful baby clothes and boys shirts. 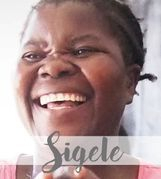 SIGELE  loves to laugh and is mum to four kids. She enjoyed learning to sew and was quick to pick up the new skill. Sigele is very good at sewing cushion covers. 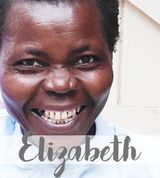 ELIZABETH is a widowed mum of three children who is an active part of her local church. She has a serious character but when encouraged, her whole face brightens with her smile. Elizabeth sews our Tiyamike Sewing shopping bags. 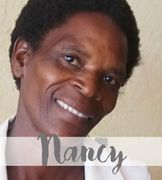 NANCY  is a softly spoken, gentle, and honest person who works hard to provide for her two children. She has learned very well and recently graduate from the Class of 2017. Nancy sews beautiful baby headbands and teether rings. 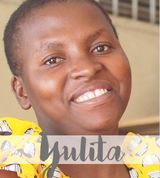 YULITA is a young mum of three who missed out on finishing her schooling. She has worked hard at learning to sew and is very thankful to now be able to run a sewing business from home. Yulita is one of our bunting seamstresses. 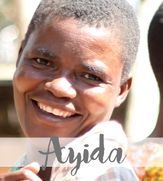 AYIDA  joined our sewing class in 2016 and has been making steady progress in her skills. She has three children and attends her local church regularly. Aside sews our mug coasters.